Read the entire Dragon Ball Culture series for only 27.99 26.59! Save 5% off the cost of buying them individually. Join Son Goku on his adventure! Dragon Ball Culture is the world’s greatest analysis of the world’s greatest anime and manga. 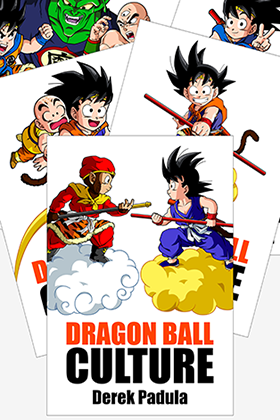 In this Dragon Ball Culture Bundle you will receive SIX volumes of content. This includes over 1,500 pages as we explore the origin of the Dragon Ball series, Akira Toriyama’s biography, and a page-by-page cultural, historical, and spiritual analysis of chapters 1 to 194 of the Dragon Ball manga. You’ll see how author Akira Toriyama synthesizes Chinese culture, Western technology, and Buddho-Daoist philosophy to create a series that speaks to your humanity. With each step that Goku takes, you’ll discover more of the hidden spirituality and symbolism in Dragon Ball that makes it so successful. Dragon Ball Culture will forever change how you view your favorite series, and yourself as a Dragon Ball fan. So let’s take our first step with Goku! Walk with Goku, Buruma, Uron, Yamucha, Puaru, Kame-sennin, Tenshinhan, Chaozu, and Yajirobe as they travel across the world in search of the dragon balls and strong opponents! I’ll walk you through the journey from the first page to the last. And by the time we’re done, you will be an expert on Dragon Ball’s culture. Will the wishes of Goku and friends come true? Let’s step inside the mind of Akira Toriyama, and find out!